Hematuria is the presence of red blood cells in the urine. If there are enough red cells, the urine can become bright red, pink or cola colored. Often, however, the urine appears completely normal because there is not enough blood to cause a color change. In this case, the condition is called “microscopic” hematuria. Because hematuria is a symptom of another condition or disorder it’s important to determine the reason for the bleeding as treatment will depend on the underlying cause. By itself, hematuria rarely causes symptoms. Hematuria may present as obvious bright red blood or the urine may be a reddish brown color due to the presence of red blood cells. Sometimes, the presence of blood in the urine is not visible and is only detected in the laboratory when urine is being tested for another reason. When blood is visible in the urine, the condition is referred to as macroscopic hematuria, while it is called microscopic hematuria if the blood is not visible. 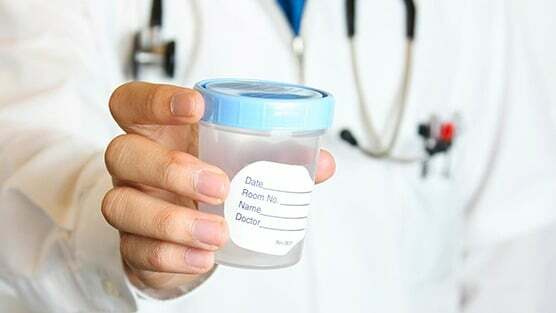 Medical history: Taking a medical history may help your doctor to diagnose the cause of hematuria. He or she will ask the patient to provide a medical history, a review of symptoms, and a list of prescription and over-the-counter medications. Blood tests: can check for signs of urinary tract infection, kidney failure, anemia (which often accompanies kidney problems), bleeding disorders, or abnormally high levels of blood chemicals that can encourage the formation of kidney stones. Urine culture: In this test, a sample of urine is monitored to see if bacteria grow. This test is used to confirm a kidney or bladder infection. Imaging tests: Such as CT scan, MRI or ultrasound are used to look at the inner and outer parts of the kidney, ureters and bladder. Cystoscopy: In this test, the doctor inserts a flexible telescope into the urethra and passes it into the bladder to inspect the bladder lining for tumors or other problems. This test usually is done with local anesthesia and sedation. Hematuria has no specific treatment. Instead, your doctor will focus on treating the underlying condition. This might include, for instance, taking antibiotics to clear a urinary tract infection, trying a prescription medication to shrink an enlarged prostate, or shock wave therapy to break up bladder or kidney stones. If the underlying condition isn’t serious or potentially life threatening, no treatment will be required.